Three of Moonlit Sanctuary’s Bush Stone-curlews. One of the major conservation actions for Bush Stone-curlews in southern Australia is population supplementation – the release of captive-bred birds into the wild. Such intervention has proved successful at a number of sites (eg. Mulligans Flat, ACT; Nature Conservation Working Group, NSW; Perth, WA) and is the focus of Trust for Nature’s curlew conservation program in the Koonda Hills. Several techniques have been used to identify and monitor released curlews, including leg bands, leg flags and radio-tracking. Radio-tracking technology has improved significantly in recent years through miniaturization, incorporation of solar charging to extend transmitter life and use of GSM technology. 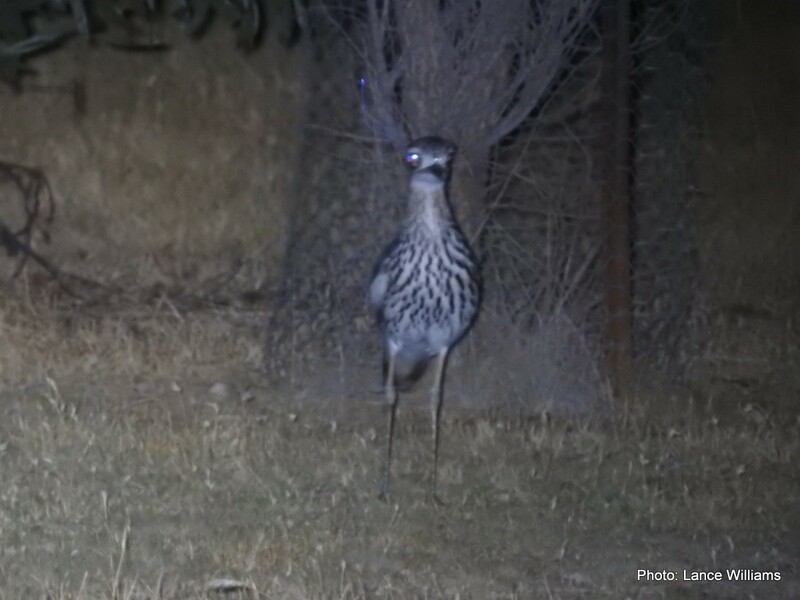 Though previously used to monitor Bush Stone-curlew releases (South Australia, Victoria, Western Australia), radio-tracking has generally used VHF transmitters attached to birds for relatively short periods (weeks & months). The ability to monitor the location of released curlews with GPS accuracy and for extended periods (months & years) would vastly improve assessment of release program success and contribute significantly to our understanding of the ecology of this fascinating and, surprisingly, poorly understood species. Bush Stone-curlew habitat and day roost north of Baddaginnie. Note the curlew pair in bottom left of image. One thing I have learnt in the past few years looking for Bush Stone-curlews, is that locals hold the key to understanding where these birds are. So, while we’ve called this project a survey, it’s really about connecting with people – farmers, landholders, residents. 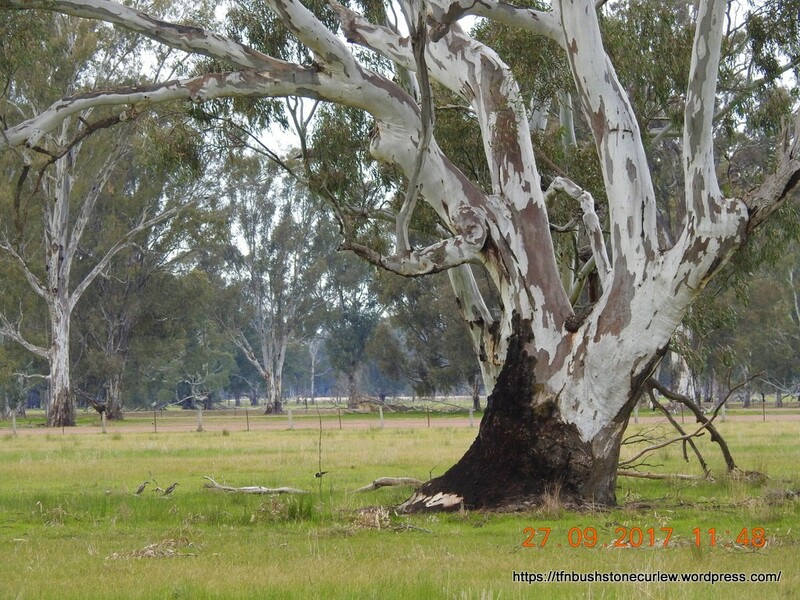 Two 100+ year old Sugar Gums in a paddock near Benalla. In the 1980s this was a Bush Stone-curlew nest site (Andrew Bennett pers. comm. ), but has been abandoned for many years. We’ve been keeping tabs on Bush Stone-curlews in the Koonda Hills landscape for a number of years. Several breeding pairs are known, and while some birds have very regular haunts, others roost and breed in different locations from year to year, so getting reliable estimates of curlew numbers and their distribution is difficult. And there are individual birds that may move around the area without settling down. What you thought you knew in one year, may not apply in the next. Libby and Steve are ‘curlew guardian angels’. Since purchasing their land in the Koonda Hills several years ago they have diligently cared for their resident pair of Bush Stone-curlews and helped them rear several clutches of chicks. After becoming used to the pairs regular presence (hearing their calls), Libby and Steve were disturbed by two months of seeming absence, from mid-November 2015 to mid-January 2016. But just as they were beginning to fear the worst – ta da! Here’s one of Libby and Steve’s latest video captures – read all about this vid (and more) on their Victorian Natives Facebook page. Bush Stone-curlew, Upotipotpon, NE Vic. 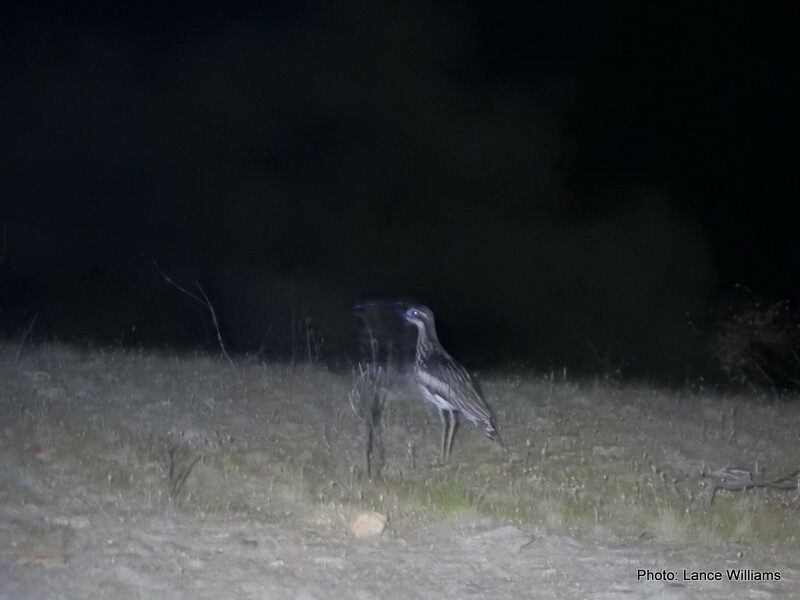 This single Bush Stone-curlew visited a property in Upotipotpon on three successive nights in mid-November 2015. 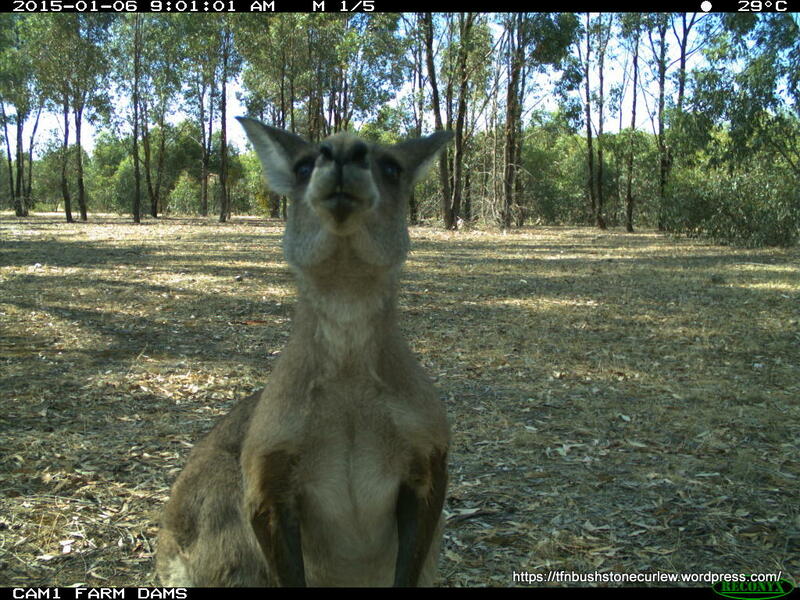 It allowed the photographer, landowner Lance Williams, to approach fairly closely (~15 m) to get this photo. Presumably the same bird was the one seen on the other nights. It’s doubly exciting, as this property is the site of one of TfN’s predator-proof enclosures, though this bird clearly preferred the proximity of fluorescent lights and humans, to the relative safety of the fenced site. Judging by the size of the bird and given that it’s still the curlew breeding season, it’s unlikely this was a young bird; more likely an adult out and about, looking for some company. Curlews have been recorded on this property intermittently over the last 10 years, but never so close to human habitation. The first the residents knew if the bird’s presence was when it called and then discovered the bird withing torch-beam distance of the house. The question is ‘Why would this bird come so close to the house and start calling?’. It’s clear that curlews are individuals and have highly variable behaviour when it comes to humans (and lots of other aspects of their ecology). Could it be attracted by the insects drawn to house lights (it was a cool night with little insect activity), or had this bird become used to human presence previously (at another location) and, seeing the house lights, felt ‘at home’ close to the house. Or could it be that this bird has experience of finding other curlews near light sources – was the well-lit house just a big, full-moon? We’ll never know, of course, but it’s presence on this property is an encouraging sign for the landholders and the project. The same Upotipotpon curlew (presumably) on another night. Thanks to Lance Williams for permission to use his rushed snaps of the curlew visitor. … but will they survive? As part of this project we’ve been keeping an eye on one of the known curlew pairs in the district, that have previously bred inside a ‘fox-proofed’ enclosure. Whilst we know that foxes can get into the enclosure, we don’t know what impact the foxes are having on breeding success. This season we took a punt and placed some trail cameras in the vicinity of where the curlew pair seem to hang out. here’s what we found. The site is not far from a busy country road, though the traffic doesn’t bother the birds at all. The camera placement turned out to be pretty good. Both cameras were placed on the same tree, the Reconyx at 120 deg, the Bushnell at 225 deg (see below). Here’s one of the pair walking across the scene. 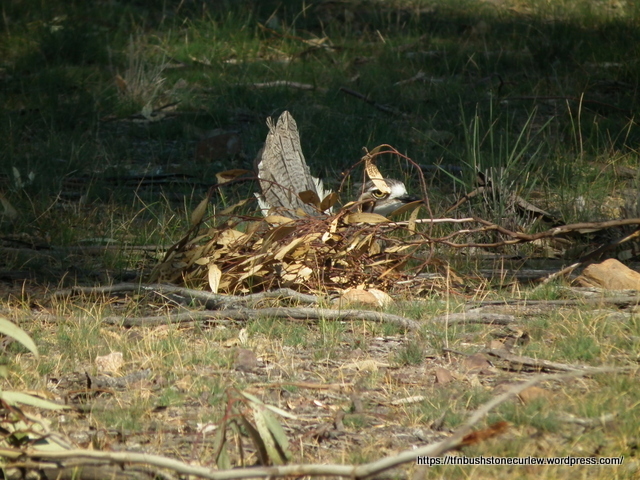 Is this Bush Stone-curlew sitting on eggs? In northern Victoria, curlews begin egg-laying in August-September – some earlier, some a little later. More surprisingly, some pairs choose a rather natural setting for their nest, while others pairs choose Main St! Photo: George P Chickenhawk, Brisbane. Forget pics of what you had for lunch, post pics of curlews you see on the golf course, beside the road, or in the bush, straight to their own FB page. Why not share your observations – what goes around comes around – we’ll all end up learning more about these fascinating birds. Explore Bush Stone-curlews on Facebook to see what other landholders are finding. And here’s an example – a short FB vid of nesting Bush Stone-curlews. At a recent Seminar for threatened species projects funded by the Victorian Government, our project presented a poster that summarizes the conservation issues facing Bush Stone-curlews and this project’s actions in mitigating threats in the project area. Here is the poster, in four parts, as presented at the Seminar. Click on an image to enlarge. With the sites now fully fenced, we should start seeing changes in what happens inside the fence. 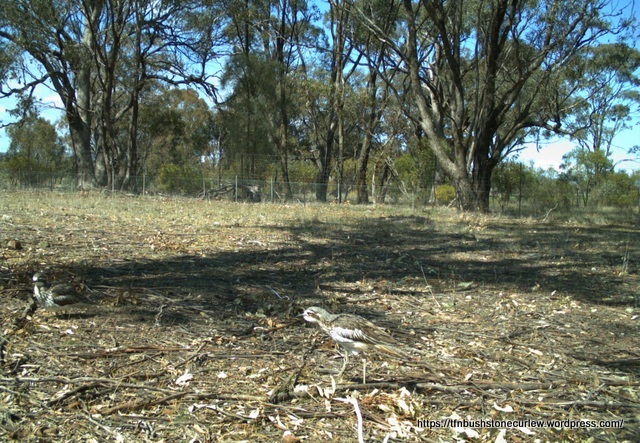 Here are some images of the fencing, habitat and fauna of Bush Stone-curlew Site 1, in the Koonda Hills, Victoria, before the fence was completed. The 10 ha site is a mix of woodland and box-ironbark forest that is regenerating after 100 years of agricultural use. Luckily, some mature Grey Box paddock trees survived and are now repopulating parts of the site. The landholders have also undertaken direct seeding and planting of understorey in the site. The site has two vehicular gates and two pedestrian gates to facilitate management. The Goulburn Broken CMA is a long-term supporter of Trust for Nature.